Shabbat begins to wind down before dinner. The whole camp gathers together at Tzippori, the lower amphitheater that overlooks the sports fields. The sky is beginning to turn bluish-pinkish. At Tzippori someone may teach a song or tell a story. Debbie may ask Yavneh trivia questions. Our third year madrichim, the Cornerstone Fellows, put on a skit depicting the adventures of Zack and Corey, looking around the world for Shabbat HaMalkah. So far, they have not found her, BUT they have discovered a variety of Jewish life in foreign lands. After Tzippori, we all go into the dining room. Dinner is quick because everyone is excitedly anticipating the quiet singing that happens before the really loud singing. As if one, everyone in the chadar sways as we sing Kol HaOlam Kulo, Adon Olam, and Shir HaMaalot, which leads right into our final birkat hamazon of Shabbat. When quiet singing is done, the Kerem (16 year old CIT’s) exit the building to light candles and line the path from the chadar ochel to the Beit Am. 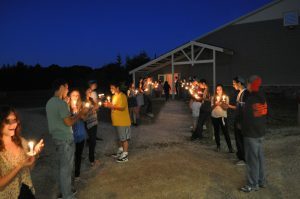 The campers walk through the embracing arch of Kerem arms as they softly sing Hebrew songs. But that is where the quiet ends. In the Beit Am each ayda stands arm in arm in a circle as they sing a variety of songs prior to actual havdallah. Jumping and dancing, bouncing and rocking as the campers feel the spirit of the moment, sad to see Shabbat leave, happy to be together, sharing this event as one.